Construction jobsites are often located in areas that may not be considered safe for employees working there. And recently, there have been photos posted on websites showing construction workers carrying holstered handguns. 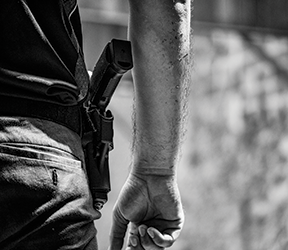 Issues surrounding personal possession of weapons are often fraught with controversy, and employers must tread carefully when considering how best to address them. Under the Occupational Safety and Health Act, employers have a duty to provide a safe and healthy workplace, which includes protection from workplace violence. In addition, many states have individual laws limiting employers’ abilities to restrict weapons. Striking a balance that keeps employees feeling safe yet respected can seem impossible, especially as stories of violence swirl in the headlines. In a report published on January 23, 2018, by the Bureau of Labor Statistics, there were 500 workplace homicides in 2016, 79 percent of them involving guns. Though many employers choose to ban guns on company property, several states have recently passed “parking lot” laws. These laws often override such policies and allow employees to keep their legally owned weapons safely stored in their vehicles at work. Where are weapons addressed in your employee handbook? If they are mentioned only within a larger workplace violence or code of conduct policy, consider separating weapons into their own policy. The policy should clearly define what constitutes a weapon, whether they are allowed on company premises, and how violations of the policy should be reported and will be handled. Be sure to review all state and local laws, and post all required signs clearly within view of employees. When workplace shootings make the news, many employees understandably fear for their own safety at work. Take this time to reach out and remind them of your company’s commitment to keeping them safe, and ask them how you can make them feel more secure. Regularly assess your safety policies by requesting employee input, and adjust them as necessary. Your workforce’s peace of mind should be your primary goal. It’s no longer enough to send out a policy and assume employees have read and learned it. In today’s uncertain environment, effective training is one of the most important ways to protect your workforce. Train managers to recognize warning signs of violence. Don’t wait until your company experiences a violent episode to address the issue of weapons. While no approach is foolproof, it’s worth your time to consider the unique circumstances of your workplace and how to protect it. Train leadership to take employee concerns about safety seriously. Train all employees to identify and react to active shooter situations. Experts agree that the more people practice these skills, the more likely they will be to act on them instead of freezing up in the event of an emergency. The Construction Regulatory Update Newsletter keeps you up-to-date with 1926 regulatory changes and new safety information. It delivers critical jobsite safety and compliance information every month. Click Here for a free, no-obligation trial.